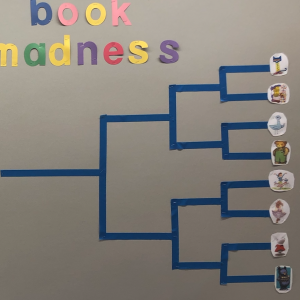 Across the nation and through many different types of libraries– you will see the brackets go up— most focusing on a book title to go up against another title. I choose to do it a bit differently– focusing on the characters of picture books. It helps because I work at a city branch and I want to give lots of patrons the opportunity to check out the contenders and also give a little love to our picture book circulation. I start with our 16 favorite characters— looking at our circulation stats— and then thinking about the collection in terms of classic characters, beloved favorites, popular characters, and wild cards! The wild cards are fun ways to bring light to different books. 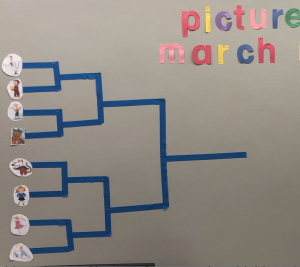 I created our bracket using painter’s tape, a stapler, and cut out characters. 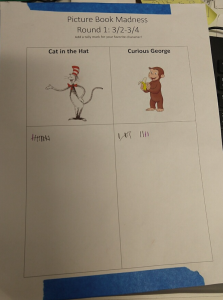 Each 3-4 days, we vote with a tally sheet at the children’s desk– great for positive interactions with the community, and we also vote at story time and our programs so that we get as many votes as possible (and also another chance to talk up the program). And then their character moves on. The first year Curious George won, and last year Pete the Cat took the victory! We celebrate with a party in April– I try to show a movie (if possible) and have a story time/craft to celebrate. 1- I have to seed the competition. I’m not a sporty person, so the first year I just matched characters randomly. But, I have learned that I have to help create a real competition. 2a- Gender is a THING! It is painful to share this– but the votes for “female” characters are less than for the “male” votes. Which I would love to study at length. 2b- I have to pit the female characters against each other to guarantee that some make it to the next round. This year, I thought strategically about the bracket in order to move female characters to the next rounds. 3- Adults get really into this! People love this, they will want to talk about it a lot, and also will get into the competition. 4- It’s a good lesson on informed voting. When they don’t know the characters, take a moment to have them read their books— and make an informed choice! It’s never too early to start thinking critically. This is one of the benefits of using characters, between picture books, easy readers, and board books– we usually have SOMETHING they can read. Note— March Madness is trademarked– but from my research they more care about commercialized use of the phrase. I typically call my passive program– Picture Book Madness like this post, but my this year did decide to use official MM phrasing to not confuse patrons. Check with your communication or management before you use it if you have concerns. NCAA has a guide here that walks you through their rules… and nowhere does it discuss library bulletin boards, so I think I am safe. I love this idea! Fantastic in all ways! This was very useful. My kids at my library love all sorts of picture book characters. This is a great way to see what character is the most popular. I have an idea which character it is.